The Kershaw TaskMaster Shears model 1120 are just about as multi-functional as one can find in a pair of scissors. This shears are good for just about anything including kitchen food prepration, small game cleaning, or for projects in the workshop. The serrated edge on the blades not only give superior cutting power, but they have the ability to grab onto things and keep them from slipping away. If this is not enough there is a bone notch in the blade that will capture whatever you are cutting even more tightly. Then, Kershaw did not stop there. 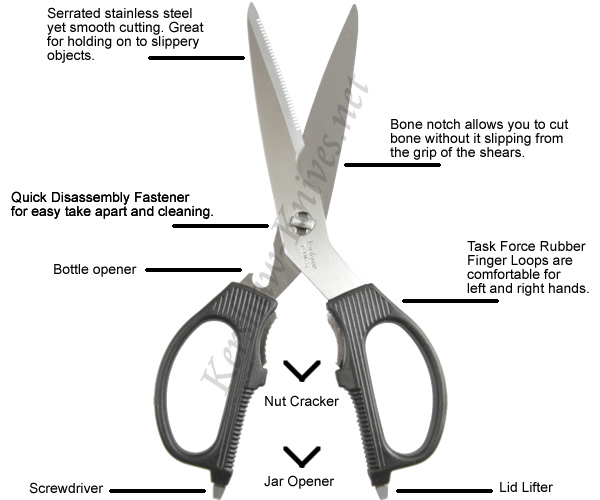 They used the rest of the body of the scissors to add a bottle opener on the outside finger guard, a nutcracker in the pivot, a jar opener inbetween the finger guards, and a lid lifter/screwdriver on the very end.